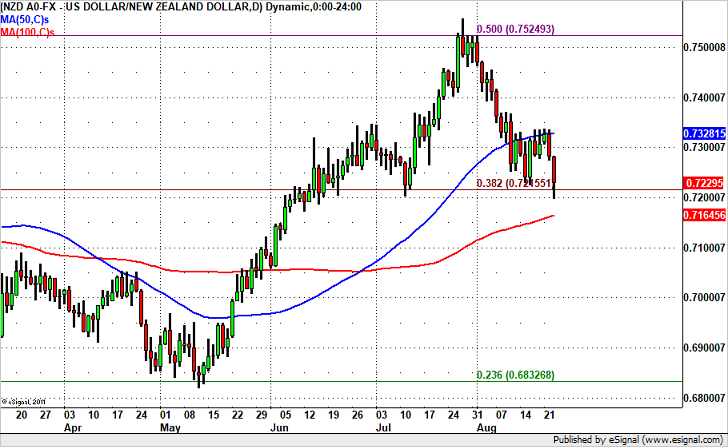 NZD/USD Destined for 71 Cents? For the second day in a row, the New Zealand dollar was the worst performing currency. Unlike yesterday when the decline was drive by U.S. dollar strength the latest move was driven by local factors. Last night, the New Zealand government provided its latest economic update ahead of next month’s election and while they forecast a significantly larger budget surplus this year, they expect growth for the year to June to be 2.6%, down from a previous estimate of 3.2% and for fiscal year 2018, they now expect 3.5% growth instead of 3.7%. These lower growth projections combined with the Reserve Bank’s unease about the currency and talk of intervention puts NZDUSD on track to test 71 and possibly even 70 cents. Technically, today’s decline has taken NZD/USD below the 38.2% Fibonacci retracement of the 2014 to 2015 decline but a late day bounce leaves the pair settling right above the Fib level. If NZD/USD breaches 72 cents, there will be some support at the 100-day near 0.7165 but the main support level should be 71 cents. There’s also a clear head and shoulders pattern that confirms our view that the path of least resistance for NZD/USD should be lower.